Series History: Georgia Southern leads the series (2-1). The teams first met in 2005 in San Marcos, with Texas State coming out on top 50-35. However, Georgia Southern has won their last two meetings (2014,2015) since joining the Sun Belt. Offense: Shai Werts – Georgia Southern should have no problem with this game if they execute. The execution of this option attack begins with Werts. While his yards per carry have dropped, he’s still averaging over 90 yards per game on the ground. Werts hasn’t done much through the air (72.6 ypg), but he’s done an excellent job of avoiding the big mistake (0 interceptions) all season. Defense: Logan Hunt – The Eagles’ sack leader (3.0), Hunt will have to get pressure on whoever Texas State has under center. The Bobcats like to air it out, but due to an injury to starting QB Willie Jones, they’ve had to turn to freshman Tyler Vitt. Whether it’s Jones or Vitt, Hunt should have time to get home, with Georgia Southern’s solid secondary behind him. Touchdown #TXST: Hutch White throws it back to Tyler Vitt for the score. Offense: Tyler Vitt – The freshman quarterback is coming off his best performance of the season. Vitt stepped in two games ago for the starter, Willie Jones, and has performed well. Last week, against Louisiana, he completed 28 of 39 passes for 296 yards and 3 touchdowns with 0 interceptions. This is Vitt’s offense now, but he’ll be facing a Georgia Southern defense that has only given up 2 touchdowns through the air and picked off 6 passes. Defense: Bryan London II – State’s sack leader, London is the heart of the defense. After the Bobcat’s loss to Louisiana last week, Texas State’s head man Everett Withers was quoted as saying “Nobody played good on defense. Nobody — Bryan London didn’t play well — nobody played good on defense. So, we can’t do that. Bryan London has to play well for us every week to have a chance to win. Simple as that.”. Georgia Southern wins if: They stay true to their identity: getting down-hill, great pass defense, and suffocating drives. This should be a comfortable win for the Eagles, unless they try to get cute. Get through this win and take advantage of the extra days of rest, before heading to New Mexico. 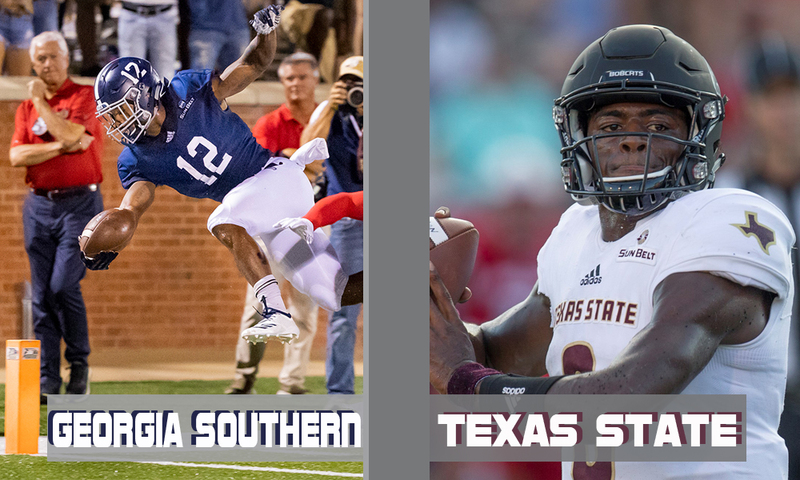 Texas State wins if: They get Georgia Southern off schedule. If Georgia Southern is consistently operating from 2nd and short, Texas State is in trouble. They have to commit extra bodies in the box on 1st down and play disciplined defense on 2nd and 3rd. If they can do all of that and get a huge performance out of Vitt, the Bobcats have a chance. Texas State is still searching for their first win over an FBS team. The Bobcats gave up 327 yards to Louisiana last week, that could spell trouble in this one. The Eagles should take advantage of the next two games to get to 6-1 and bowl eligibility, before they get to the meat of their Sun Belt schedule.